The 'In Rainbows' Experiment: Did It Work? In 2007, Radiohead no longer had a contract with its record company, EMI, and was about to release its seventh full-length album, In Rainbows. For its first new release in four years, one of the world's biggest bands would have no major-label representation. 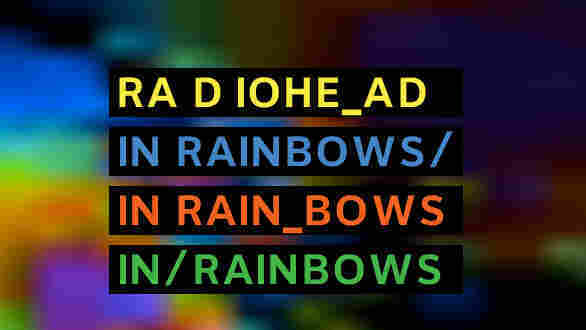 In Rainbows was first released on Oct. 10, 2007, as a digital download from the band's Web site. Fans were encouraged to "pay what you wish" — even nothing — and a "digital tip jar" was set up to collect voluntary payments. On Dec. 4 of that same year, an $80 deluxe box set was made available to order online; finally, on Jan. 1, the physical CD and digital album hit retailers. Those are the facts. But what did "the Radiohead experiment," as it would come to be known, mean? From the start, journalists couldn't make up their minds. There were plenty of articles anointing this "new model" as the best path forward for the whole industry. The New York Times wrote, "For the beleaguered recording business, Radiohead has put in motion the most audacious experiment in years." The Los Angeles Times ran an editorial titled "Enough Radiohead Already!" (and, yes, the exclamation point was theirs). By that time, I couldn't have agreed more. But when Radiohead's management and a British music-industry economist named Will Page invited me to collaborate on a study analyzing the In Rainbows online release in some detail, I was intrigued. I might have held out for better terms. "Nobody's paying for this," I was told. "We're going to give your paper away free, online." No pay-what-you-wish option? Page quickly shored me up: "If we get this right, maybe you'll get paid on the next one." The next one? "Maybe we'll get backstage or something," he offered. We worked like fanatics. While Will poured over sales data from the band, I scoured the Internet for comparative data on the biggest bands of that moment: Gnarls Barkley, Panic! at the Disco, Nine Inch Nails. Despite the fact that the band offered a legal free and low-cost option to obtain the album from its Web site, piracy was up. Way, way up. In fact, In Rainbows was downloaded from unauthorized sources at 10 times the rate of new releases from other top artists. On file-sharing networks, 400,000 copies of In Rainbows were swapped in a week. By the end of the month, the number was more than 2 million. "Frequently, music industry professionals suggest that an increase in legitimate sales must necessarily coincide with a commensurate reduction in piracy, as if this were a fact," we wrote. Yet we found that piracy rates follow awareness and interest. "The biggest-selling albums and songs are nearly always the most widely pirated, regardless of all the 'anti-piracy' tactics employed by music companies. Or, to sum up by paraphrasing an earlier argument, 'popular music is popular everywhere it's popular.' "
Popular is popular. Who knew this simple truism would cause such a stir? Like any hot property, our paper leaked ahead of publication. I found myself on the phone at odd hours of the night with news organizations all over the world. They all wanted an answer to the same question: Why was piracy up, not down? Why did the new model fail? Even industry heavyweights weighed in. Referencing our own research (I'd like to think), U2 manager Paul McGuiness said, "Radiohead's honesty-box release of their album, to some extent, backfired. Even though it was available on their own Web site for no money at all, if that was what you preferred to pay — 60 to 70 percent of the people who downloaded the record stole it anyway." Did the band care? It was difficult to tell, since its members shrugged and claimed that no lessons should be sought here at all — that the experiment was not prescribed for anyone other than Radiohead. Oh, and it was just as a one-off, at that. Fair enough. But in the final accounting, there was plenty to celebrate. In Rainbows entered the Billboard chart, the U.K. Album Chart and the United World Chart at No. 1, and went on to sell millions worldwide. According to Radiohead's publisher, Warner Chappell, In Rainbows made more money before the album was physically released than the total sales for the band's previous album, Hail to the Thief. Meanwhile, music fans were thrilled — as we are always thrilled — with great music that comes free, or cheap, and directly from the band, instead of through corporate filters. In Rainbows was an important milestone on the path to fans having more avenues to obtain music and feeling more connected with the artist. There was a lot of discussion at the time about whether other bands would follow suit, "pull a Radiohead," and give away their albums. On what's essentially the two-year anniversary of In Rainbows' release, I'm struck by how safe it all seems now. Releasing a pay-what-you-wish album now is almost yawn-worthy. Major artists are experimenting with price points, novel distribution models and giveaways at a dizzying pace. But we aren't any closer to knowing what works or what will become a consistent model for the future. Today, with the increasing popularity of free (legal) music streaming, the music industry's core issues are more complex and much more urgent. Will fractions of pennies per play ever replace booming 1990s CD revenue? Will people even use digital tip jars if they can just press play to hear anything, any time, anywhere? In 2007, letting fans choose was "the most audacious experiment in years." Two years later, it's almost quaint. Postscript: The In Rainbows research project came to a fitting conclusion in June of last year, as I sang myself hoarse in the audience of Radiohead's Victoria Park performance, and then later hung out with the band and its team after the show. The paper got us backstage, but it would be nice if we could figure out how to get paid, too. Will Page and Eric Garland's In Rainbows, On Torrents is available free (sorry, no gratuities accepted) here.